Lynn Margulis is the author of one of the most influential theories in modern biology. The basic ideas behind SET (Serial Endosymbiosis Theory) have been in hidden in the wings of biological thought for a long time but Margulis brought them onto center stage and has vigorously propounded her ideas in many books and other media. She is that rare combination of professional scientist in command of the nitty gritty facts as well as the sweep of a grand theory, plus she is an excellent writer. Symbiotic Planet is a popular layman's guide to symbiogenesis. Margulis lays out the supporting facts and builds the theory that describes the evolution of complex multicellular life forms as a combination of simpler prokaryotic beings. Chloroplasts, mitochondria, and flagella all existed (and their descendents continue to thrive today) as independent cells and later merged and then co-evolved as integrated organisms known as (in her term) protoctists. Those unicellular beings, neither plant nor animal nor fungi are the ancestors from whom all those knigdoms have evolved. A systematic taxonomy is presented in another of her books Five Kingdoms. One of the best aspects of this book is the autobiographical material relating to her early life, including her marriage and subsequent divorce from the famous astronomer, Carl Sagan. She also relates in a lively style her college studies, first attempts at publication of her theory and her struggles to gain acceptance for what she saw as the indisputable facts of evolution. 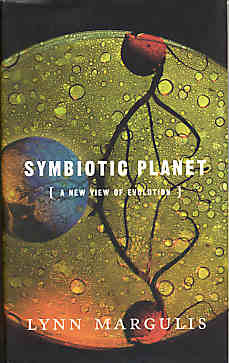 Symbiotic Planet is an easy and very informative read by one of the main players in modern biology.